If you’re one of those people who believes creating art is a pastime rather than a lifestyle, you should have a cup of coffee with Millie Doud … if you can catch her. For the past quarter century, Doud has created hundreds of pieces of art, taught scores of classes, held more than a dozen positions in area arts organizations, and introduced thousands of visitors at Brookgreen Gardens to the beauty of sculpture and wildlife. And that’s just in her retirement. Doud, 86, moved to the Grand Strand from Maryland in 1992 after a career teaching high school art. She knew she wanted to get involved at Brookgreen Gardens immediately, but the remainder of her art career has been a spontaneous evolution. “It’s surprising. It’s adventurous. It’s been wonderful,” Doud said. Doud works in media ranging from clay to acrylic paint to glass to paper to recycled materials—and she claims “each one has a mind of its own.” Her work is on display at the Seacoast Art Gallery in The Market Common, Art Works in the Litchfield Exchange in Pawleys Island, and the Brookgreen Gardens gift shop. Doud has been a docent at Brookgreen Gardens for 23 years, working in the sculpture garden and the wildlife area, and has taught art appreciation, art history, and a variety of other artistic media at Horry Georgetown Technical College, the OLLI program through Coastal Carolina University and at Art Works. Essentially, anyone who frequents artistic establishments anywhere along the Grand Strand has likely encountered Doud’s footprint. Doud’s latest project is illustrating the first series of children’s books published by Brookgreen Gardens. Titled The Friendly Fox Squirrel and Wild Turkey Day, the books are written by Ron Daise, vice president for creative education at Brookgreen. 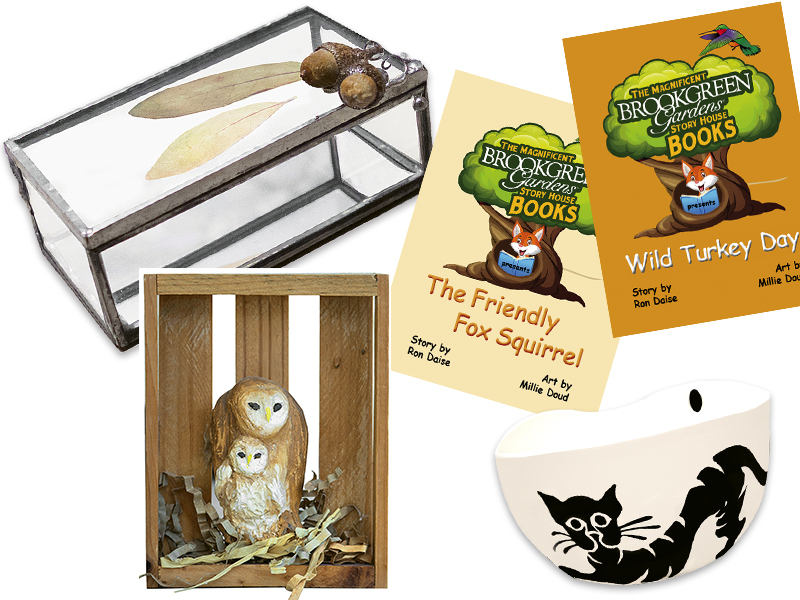 Each book tells a tale of a child who encounters an animal while on a visit to the gardens and experiences a special connection to the animal and a lesson about wildlife and the environment. Because of Doud’s twin specialties in art and animals at Brookgreen, she was a perfect fit to illustrate the series. Doud gave an animal program. DeMuth explained that Doud’s knowledge and patience with animals makes Doud a go-to for socializing animals or working with one when it’s having a difficult time. “She’s worked especially closely with a raven, a woodpecker and a skunk that came in recently,” said DeMuth. Doud also creates connections between her work and her experiences with animals. Working in the butterfly garden made her think about the ephemeral nature of the animals’ lives and how she could immortalize that beauty. 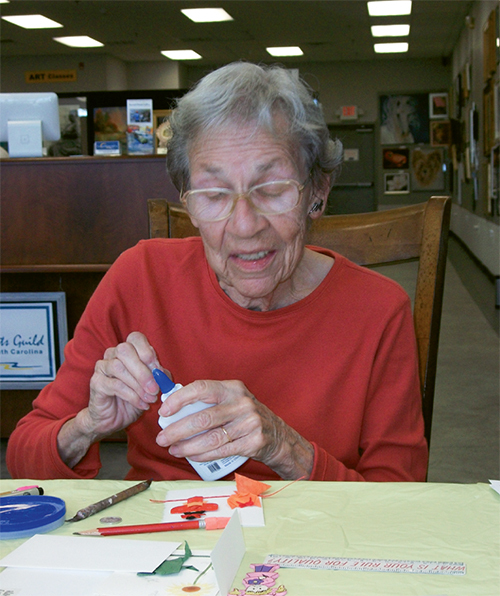 PHOTO: Doud working on origami at Demo Day at Seacoast Artists Gallery in The Market Common. Doud initiated a program to preserve the butterflies and work them into glass pieces such as boxes and light catchers, which are now available in the Brookgreen Gardens gift shop. She also painted a mailbox along the wildlife trail that holds brochures with images of dragonflies and butterflies; the beauty of her work prompts visitors regularly to inquire where they can purchase such pieces. Doud believes that remaining active and involved in personal interests is essential to health and wellbeing as we age, and she counts her colleagues as the most important part of her work. “It’s the people that make my life so great; I love the people I work with,” Doud said. However, she added that filling time is by no means the point of her art. Ketron said Doud tends to be modest about her contributions, but that doesn’t lessen their significance to the Grand Strand area.